On Tuesday February 17, prepare to get horrible as improv troupe The Fictionals move their incredibly popular monthly show Improv Against Humanity to The Vogue Theatre. Vancity Buzz sat down to chat with The Fictional’s producer and creator Daniel Chai to talk about the show’s upcoming debut at the new venue. For all the newbies, what exactly is Improv Against Humanity? 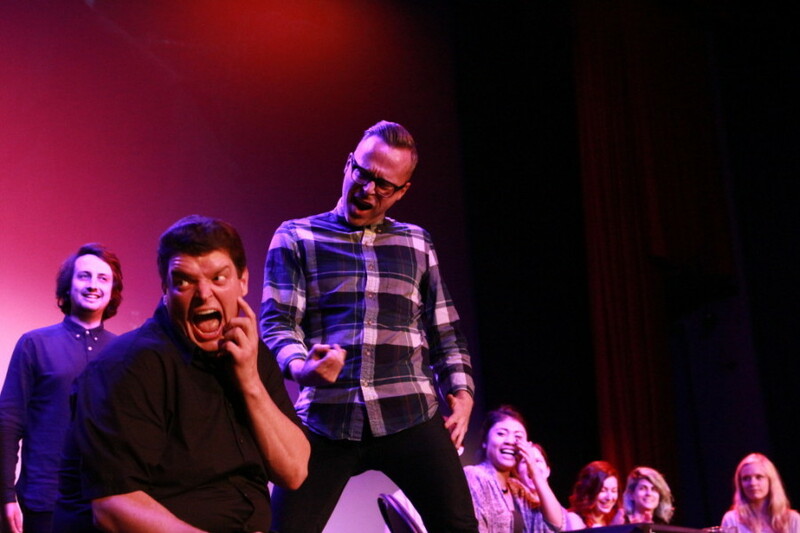 Improv Against Humanity is an interactive Live Comedy and Game Show experience. The Fictionals bring the world of Cards Against Humanity, the smash-hit party game, to life onstage with an audience tournament and improv scenes based on selected card combinations. We give out prizes, crown Vancouver’s most horrible person, and everyone leaves a little more horrible. How do you feel about your big move from The Rio Theatre to The Vogue Theatre? It’s very exciting! A little bit scary, but mostly exciting! The Vogue Theatre is gorgeous, their team is awesome, and it’s humbling to know that we’ll be performing on a stage that has had so many rock stars and comedy geniuses on it before us. The Vogue holds almost 1,200 seats so it’s a big room to fill, but so far the response from our fans has been fantastic. We’re taking Improv Against Humanity to the next level! It must be bittersweet to leave The Rio though? It is bittersweet, but The Rio Theatre has given us their love and blessing to keep growing ourselves. The Rio has been such a great home for Improv Against Humanity these past few years, and The Fictionals will still be doing shows there in the future. In fact, we’re at the Rio on Wednesday, February 11 for Show Us Your Wits: The Improv & Burlesque Extravaganza! The catalyst for us moving to The Vogue Theatre was when we turned away almost a hundred people at last month’s Improv Against Humanity at the Rio. People were having a hard time finding a place to sit, and our fans were telling us ‘you’ve gotta go bigger.’ You have to give the audience what it wants, and if the audience support is there for us to find a bigger venue, then that’s what we’re going to do. Where did Improv Against Humanity start? I was inspired to create Improv Against Humanity back in 2012 after playing the card game at a friend’s birthday party. The Fictionals launched the original at Cafe Deux Soleils on Commercial Drive and sold out the very first show. That’s when we knew that we had something special on our hands. We moved to The Rio in 2013, where most of our shows were sold out with over 400 people. And now the next evolution of Improv Against Humanity is happening at The Vogue! Can you let us in on any exciting changes for The Vogue Theatre? An exciting change for Improv Against Humanity at The Vogue is that it’s All Ages! There is still a mature content warning on the show though, so if you have a younger brother or sister who is not yet ready for live Cards Against Humanity comedy, probably best to leave them at home. The Fictionals are not going to be dialing back the content: it’s going to be risqué, raw and as crazy as people want. Other additions: Brian Anderson from Vancouver TheatreSports League joining us as tech improviser to pump the music loud, and Denise Jones, Artistic Director of VTSL, joining us onstage as our special guest this month. She’s always amazing to watch! Why is Improv Against Humanity so popular? Do you think there is an untapped group of Cards Against Humanity fans who don’t know about Improv Against Humanity? Yes, absolutely! I still meet people at birthday parties and at Fictionals’ shows who love Cards Against Humanity, but have never heard of Improv Against Humanity. Each show we do a check-in with the audience and there’s a good mix of new faces and long-time fans! Cards Against Humanity is such an awesome, easy to pick-up game; as their popularity grows, so too does word of Improv Against Humanity. And people who come to Improv Against Humanity who have never heard of the card game leave wanting to play again with their friends! Has anyone ever come up to you after a show and been really offended at something they saw? I’ve only ever received hugs and high-fives from audience members after Improv Against Humanity shows, and that’s because audiences know what they’re getting into before seeing it. We even had someone book Improv Against Humanity for a private performance at their birthday party recently, and their mom and dad enjoyed it the most! The mature content label is: “Warning: may contain some strong language, sexual content and mature themes. Viewer discretion is advised.” It’s not billed as “The Original Comedy Show for Horrible People” for nothing. I’d like to thank every single person who has ever gone out to see a comedy show in Vancouver. There are so many entertainment options nowadays: watching Netflix, going to a Canucks game, running the Seawall. So when people choose to spend an evening with The Fictionals or any of the other talented improv groups around the city, it’s very special. Being onstage as professional artists putting our creativity out into the world is an honour. 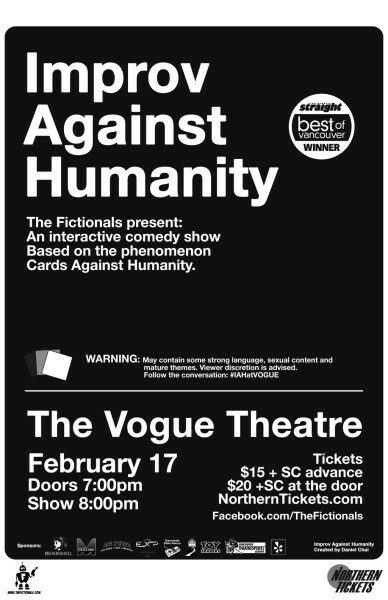 And we hope to see everyone down at Improv Against Humanity at the Vogue Theatre on February 17th! Remember, only the laughs are real! Catch Improv Against Humanity on Tuesday, February 17 at 8 p.m. at The Vogue Theatre. Tickets can be purchased from Northern Tickets. All ages welcome – Mature content warning.